The Canarian archipelago lies off West Africa and belongs to Spain. Besides attracting millions of tourists every year, they also are home for an extraordinary species diversity: 29 cetacean species have been identified here, i.e. more than a third of all existing species. Many of them are residents, others appear frequently or seasonally. In 1999 fast ferries (maximum speed up to 25 knots or 48 km/h) and high speed ferries (up to 40 knots or 75 km/h) were introduced and during the past years successively replaced almost all regular ferries. Within the first few weeks of operation in 1999 they were involved in several collisions with large whales. During a serious accident in 1999, when a hydrofoil hit a whale between Tenerife and Gran Canaria, dozens of people were hurt and one person died. This type of vessel ceased operation, albeit only years later after this incident. Small passenger high speed ferries for up to 436 persons, mostly catamarans travelling up to 40 knots. Large multihull high speed ferries, with a maximum speed of 40 knots. These include the most popular catamaran ferries as well as the largest trimaran ferry in the world (length: 142 m, capacity ca. 1,800 persons and 300 cars). The catamarans are so called wave piercer, because they cut through the waves (as opposed to displacing vessels). Traditional slow ferries travelling at around 15 knots. The figure on the right represents all ferry transects within the Canaries in 2007. Today, there are almost exclusively fast and high speed ferries connecting the islands, although the distances between the islands are not especially extensive. As an example, La Gomera and Tenerife lie about 40 km apart. Thanks to the fast moving ferries the total travel time between these two islands has decreased from 1.5 hours to 50 minutes. Although their cost effectiveness is decreasing with increasing gasoline prices, their operation nevertheless is advantageous, especially because of the many day tourists that visit Gomera for only a few hours. Additionally, the operator is substantially subsidized. A study conducted by M.E.E.R. showed that in 2007 about 29,000 ferry transects were travelled between the Canary Islands, and these covered a total of almost 1.5 Million kilometers. Almost all of these transects were operated by either fast or high speed ferries. Hence, it is understandable that there is a conflict between the development of tourism on the one side and marine conservation on the other. The real problem, however, is that this conflict is carried out literally on the back of cetaceans (and probably other marine organisms). The number of animals dying due to a collision with ferries is extremely high. Officially, 54 whales and dolphins had been killed by ships until 2008. Researchers from Canarias Conservación, a partner NGO of M.E.E.R., however, found that 11% of a total of 556 stranded animals in the Canary Islands showed injuries caused by ship strikes – resulting in a total 59 cases. Anyway there is a common trend in these numbers: a strong increase has been observed after fast moving ferries started operating in the Canaries in 1999. The species mostly affected is the sperm whale, a probable resident in the archipelago. More than 40% of cetaceans killed by ships were sperm whales, most of them being females, juveniles or calves. Pygmy sperm whales where hit regularly, too, and also a number of other species including baleen whales, beaked whales, pilot whales and others. It seems bizarre, but the high speed ferries, prime suspects for a long time, have not been identified as being the definite cause of death. 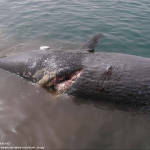 Although there were numerous cases with sperm whales missing large body parts, including incidents where only sperm whale heads were found, it remains difficult to determine the cause of death without any doubt. This is because even in those cases where an injury is so severe that it only could have been caused by a large wave piercing vessel, the animal might have been dead before it was hit by a ship. This is exactly what the ferry operators keep telling when they are accused of having hit a cetacean. Today however, investigations by the veterinary faculty of the University of Las Palmas (Gran Canaria) with newly developed methods proved that all specimen investigated were hit when still alive. Yet another main issue is the operators’ discreetness. Until today, after dozens of suspected cases and several witness reports, no ferry operator has ever reported a ship strike. They simply want to ignore the issue. 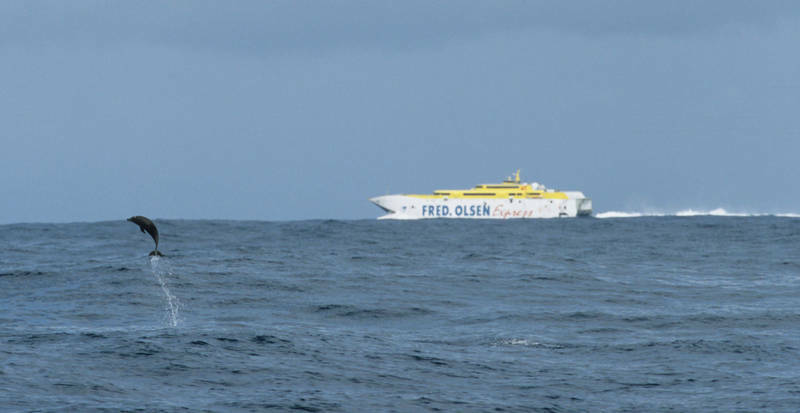 Both ferry operators of the Canary Islands “keep mum”, and both are powerful and influential. Their willingness for a dialogue with scientists, NGOs and relevant authorities is minimal. Witness reports from ferry passengers are neglected or are ‘explained’ by the fact that a whale had been dead already when it was hit. MEER received three witness reports in 2005 only, but none of them was traced in detail by the authorities. A statement by the operator appears to be sufficient to tick off these cases. Until today it remains unclear how many cetaceans are killed each year as a result of ship strikes in the Canaries archipelago. According to what we know however, a (very) high number is to be expected. 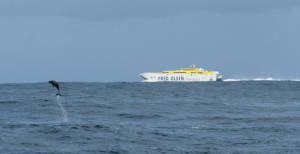 As an example, hardly anyone will recognize a dolphin that was hit by a huge ferry during darkness. 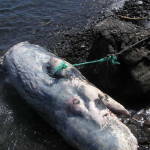 Whale carcasses often will drift away miles or simply sink to the bottom without ever being detected. Moreover, until now it’s the scientist having to prove that the death of a cetacean indeed was caused by a ship strike. And they will have to calculate the collision risk or recommend mitigation measures while more and more animals are dying. With its study, M.E.E.R. was able to identify small scale areas of high collision risk on the basis of the data provided by Canarias Conservación (e.g. between Tenerife and its neighboring islands Gran Canaria and La Gomera, see figure). But no one seems to be really interested in these findings. The lobby of tourism developers and ferry operators appears to be much more influential than scientists, NGOs and environmental politics. In some way this is even conceivable: as a tourism hot spot, you don’t want to have dead whales in the headlines. Some opposition is rising, but only slowly so. Several Canarian research groups are involved in investigating stranded animals, and M.E.E.R. constantly educates the public, authorities as well as the scientific community about the issue, e.g. during international conferences and workshops. Not least during this initiative, the issue is on the TOP list of the International Whaling Commission (IWC). IWC’s Ship Strike Working Group has conducted an international workshop in September 2010 which had a special focus on the situation in the Canary Islands. Hence it is hoped that the problem will be recognized as such and dealt with in the future.